At the end of WWI, the treaty of Versailles established the conditions for peace in Europe. The aim for the victorious powers was to make Germany pay reparations, and to guarantee a future without war. Yet a decade later, the denunciation of 'Versailles' became a powerful lever for the nazis to obtain power as these reparations would mark the beginning of the humiliation of the German people, and nurture a feeling of having been bestowed a hopeless future. In the 20 years that follow the end of WWI, the issue of reparations and responsibility will effectively poison international relationship. The treaty negative impact goes well beyond WWII as the new European borders it implemented led to many conflicts during the twentieh century. This documentary shines a light on the causality between the decisions taken with the treaty of Versailles, and the ensuing events of the century. 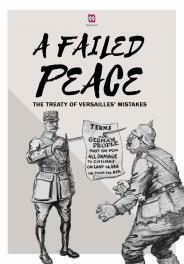 At the end of WWI, the treaty of Versailles established the conditions for peace in Europe. The aim for the victorious powers was to make Germany pay reparations, and to guarantee a future without war. Yet a decade later, the denunciation of 'Versailles' became a powerful lever for the nazis to obtain power as these reparations would mark the beginning of the humiliation of the German people, and nurture a feeling of having been bestowed a hopeless future. In the 20 years that follow the end of WWI, the issue of reparations and responsibility will effectively poison international relationship. The treaty negative impact goes well beyond WWII as the new European borders it implemented led to many conflicts during the twentieh century. This documentary shines a light on the causality between the decisions taken with the treaty of Versailles, and the ensuing events of the century.